On the weekend of June 4th, 5th and 6th I had the pleasure of attending IMAC (International Marine Aquarium Conference) held in Chicago. The conference had a host of excellent speakers and our internet site Reefs.org and online publication Advanced Aquarist was one of the exhibitors. I was especially delighted to see a seahorse club come not to sell seahorses or associated equipment, but simply to show off their large and healthy seahorses. This is but one of many pictures I took of their animals. I find it rewarding to see well fed and healthy seahorses. 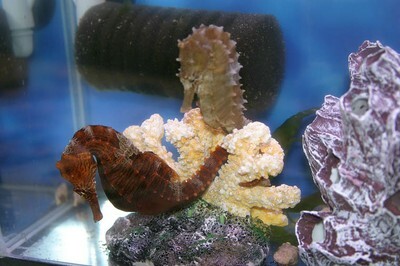 As most aquarists know trying to get wild seahorses can be quite trying and unsuccessful. These were tank raised. This brings me to the general theme, at least from my point of view, of this and other recent conferences: aquaculture, collection of wild animals that does not impact on the populations of the various collected species, healthy shipping and holding facilities, etc. If it is not our members who care about the future of these animals and their habitats (mostly wild reefs) who will – certainly not the oil companies? It also became clear from the talks and attendant discussions that success or failure finally rests with retail stores and the buying practices of hobbyists. If it is the attitude of hobbyists to buy animals by price alone, and if stores want to get the animals out of their store as quickly as possible then our hobby is doomed – these attitudes will lead to the death of animals within three months to the tune of about 90 percent. Most of us recognize that getting a fish from the wild to one’s tank in a condition that will allow the new specimen a reasonable chance to survive, even flourish, for more than a year is far from easy. In my opinion, the problem mostly lays with retail stores and aquarists whose priority when purchasing and selling is price. Fortunately, there are a few – too few-that operate from a totally different philosophy. Doug Robbins and I, after IMAC, took a trip to Inland Aquatics in Terre Haute. Morgan Litster, the owner, runs 40,000-gallons of seawater where he only buys net caught and aquacultured fish. Even then, he keeps all new fish for 4 to 6 weeks in quarantine before offering them to the public. In my close to fifty years keeping marine fish I have never seen as many healthy fish in one establishment as at inland Aquatics (http://www.inlandaquatics.com/). Next month I or Doug Robbins will devote a whole article to how Morgandoes what he does. To wet your appetite, here is one shot from the many that I took. 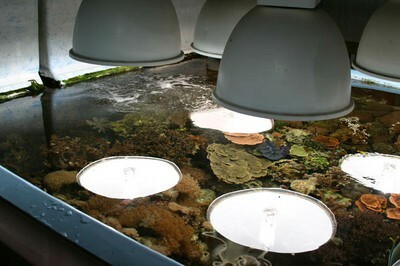 One of the many tanks at Inland Aquatics dedicated to aquaculture.